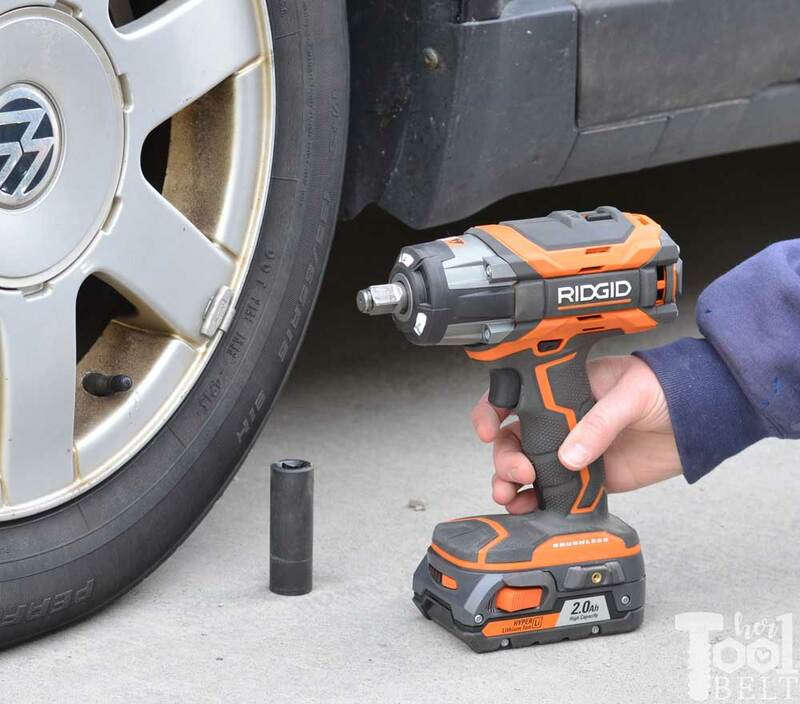 This Changing a Car Tire Ridgid Impact Wrench tool review is sponsored by The Home Depot. I have been compensated for my time and provided with product. All ideas and opinions are my own. This post contains some affiliate links for your convenience. Click here to read my full disclosure policy. Flat tires rarely happen in convenient locations, thanks Murphy! They always seem to happen on the freeway at the busiest time of the day, or on a road without a shoulder. 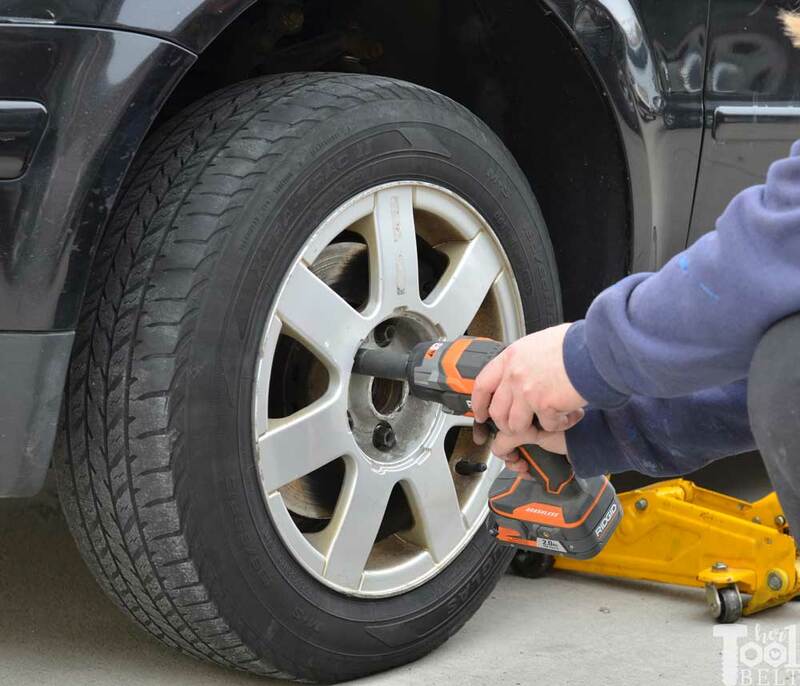 🙂 For those times you are at your house, or have your power tools with you there are some tools to make changing a car tire quick, easy and painless. 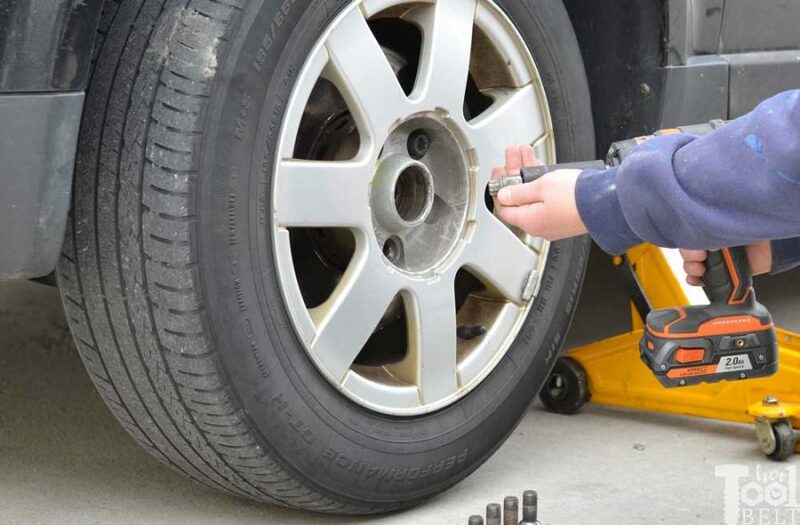 Changing a car tire is a pretty simple, and something that everyone should know how to do. 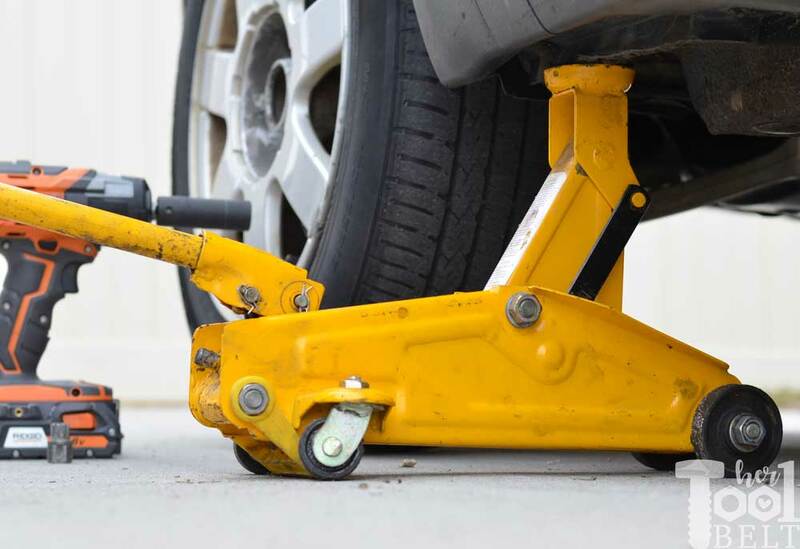 If you’re rotating tires you’ll need two jacks or jack stands. Make sure your car is in park or 1st gear, and put your parking brake on. 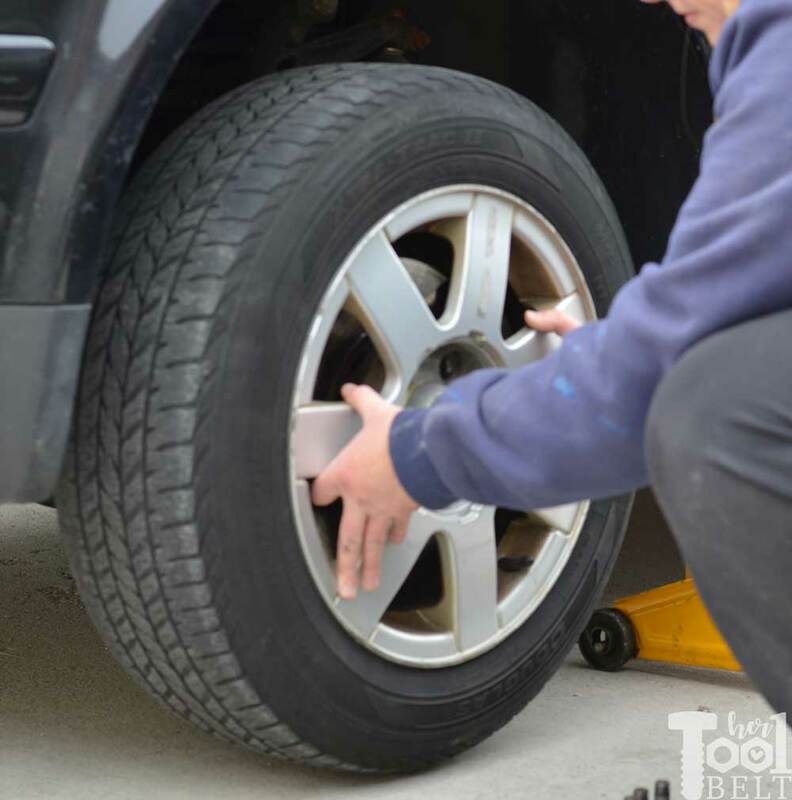 You should have a tire changing kit somewhere in your vehicle, for cars it is most likely in your trunk. Sometimes it will be by your spare tire. The kit should have any special tools needed for your type of car. If your car has a hub cap, start by popping that off. My kit comes with a flat end tool that slides behind the hub cap and easily pops it off. 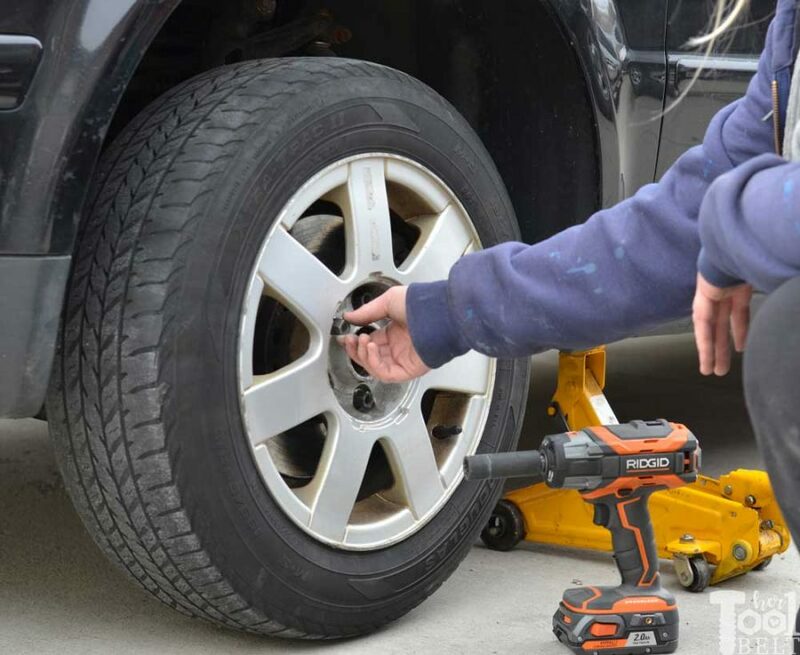 Before jacking up the tire, I like to loosen the lugs first, this makes it so the tire doesn’t spin while you’re loosening the lug nuts or bolts. If your car has one special lug, you’ll need that ‘key’. I’m using the Ridgid impact wrench to loosen the lugs. You can use a lug wrench or ‘tire iron’ to remove the lugs, but with an impact wrench I can have 5 lugs off by the time it would take me do a couple of turns with the lug wrench. Time to jack up the wheel. Using a hydraulic trolley jack is SO much easier than the little scissor jack that comes with your car. A few quick pumps with the lever and you’re done. Whether you are using a hydraulic jack or scissor jack, make sure you are lifting on the metal frame. Finish removing the lugs. Most vehicles will have lug nuts, and there will be studs on the wheel hub. 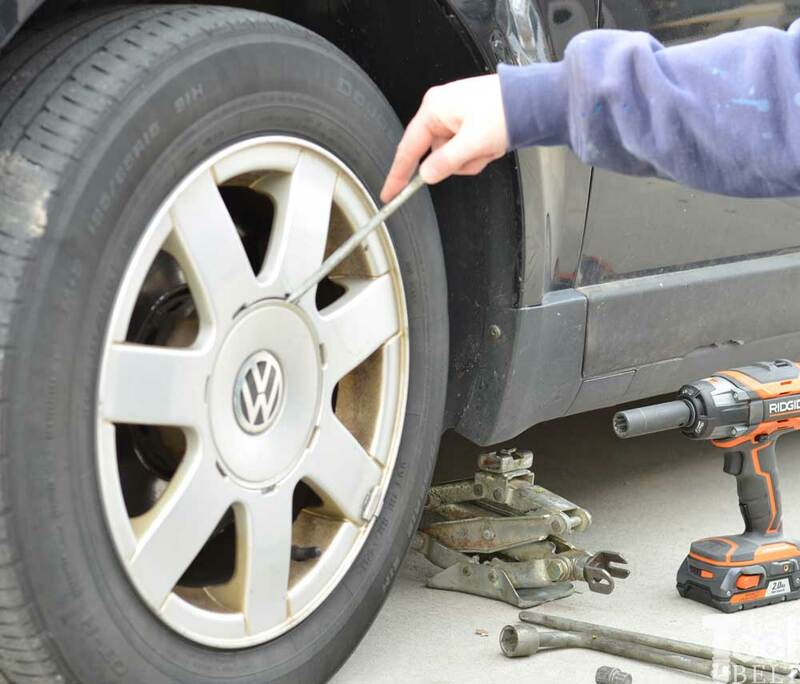 Some cars (German made) will have threaded holes in the wheel hub and you are removing lug bolts. Mine has the lug bolts, but the process is similar. It’s a good idea to start the lug nuts/lug bolts by hand, to make sure you’re not cross threading them. My wheels have one special lug bolt with a different pattern, it requires the lug key. Finish tightening your lugs. It’s best to do a star pattern when tightening the lugs and double check that they are tight. Pop on your hub cap, if needed. Lower the jack, put away your tools and tire (if needed) and you’re done! Quick and easy. I’ve been reviewing the new RIDGID 18-Volt GEN5X Brushless 1/2 in Impact Wrench. I can’t think of a negative feature about this tool, it’s great. You’ll notice it has a lower trigger on the handle, that is for a flashlight in the head. Great idea for when working in dark places. It also has 4 options for RPM settings on the head. I imagine I’ll leave it in A for most uses. The manual also touts 450 ft-lbs of maximum torque. Although I didn’t measure the torque nor speed, I can tell you it works slick on lugs and removes them with minimal effort. The grip is very comfortable. Another nice selling point of Ridgid tools is that they are backed by the lifetime service agreement. My husband has been wanting an impact wrench for years and he is THRILLED about it. He ‘loves’ 😉 working on and fixing our old cars! This mature car is going on 19 years, woot woot. 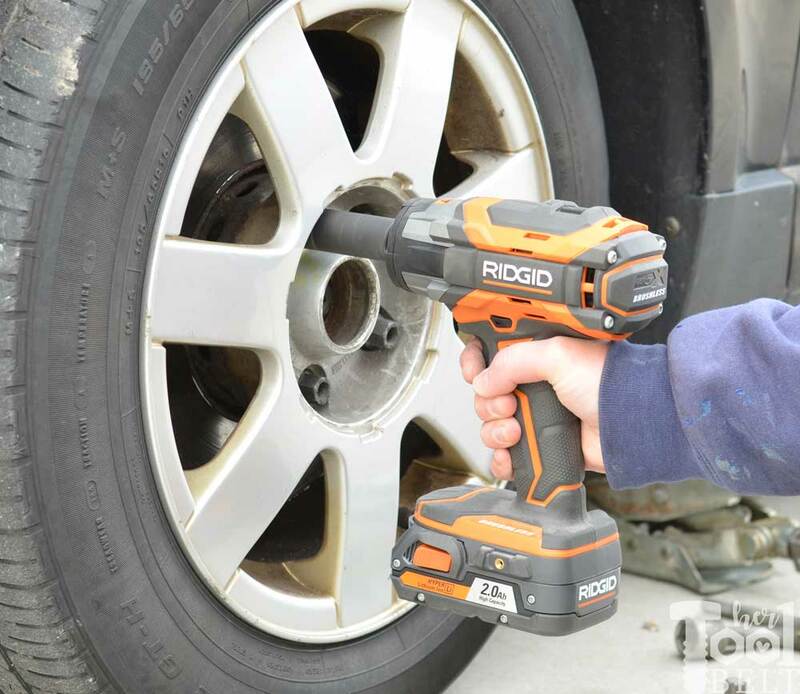 If you work on your cars, the Ridgid Impact Wrench will be well worth the money!